I’ve been waiting a long time to make this news public but now that I have all the necessary documentation and the children in my class and their parents have been told, I can finally tell everyone that I have a new job!!! Hence why there was not too much running in January; I really, really wanted this job so was too busy studying and it paid off! So after the spring break I will only be travelling 15 mins to work, just over the Erskine Bridge, to a school in West Dumbartonshire where I will be the principal teacher, particularly of the infant department which has 6 classes. This is definitely the job that was meant for me as the ethos in school seems great, there is lots of outdoor learning and other initiatives, it’s 15 mins from home after years of lots of driving and the head teacher whom I liked immediately ran the WHW race a couple of years and has done the Fling etc! I’m really excited about starting and things really feel like they are going in the right direction for me. I will be sad to Castlefield as it and the people there have been a big part of my life for quite a while now but I’ll still be keeping in touch with, particularly for our reciprocal visit I am arranging with the headteacher and the deputy head teacher of Gwengwe Primary in Malawi. I plan to start writing on this blog again now to reflect on my new role and responsibilities. I concentrated on my primary 2 class blog this year and really loved what that offered the pupils and parents and will definitely do that again but I want to use this one for me again now. I’ve just had two fantastic days RM update training on various software programmes that are going to be of use in school after the refresh, some of which we already have and I have used before like Podium, textease and Comic Life and some others like Stop motion pro and revelation. One of the things we were focusing on was how these could be used as some kind of eportfolio and I think there are huge possibilities for this with these programmes. We also mashed different programmes together, putting a lot of what we did in other programmes into textease to then enhance it further. Here are some examples of what I was working on, they are very much just a quick taster. I spent an enjoyable morning at LTS talking with and being filmed by Con Morris and Anne McGhee about my Malawi CPD, it’s the first time I’ve ever managed to forget about the camera being there, probably because I could talk about that all day long! I was then up in Castlefield to do a lesson on rights and responsibilities with P5/6 and P6. This was part of our link school programme, LCD run a yearly event at this time that all link schools in both countries have the opportunity to take part and swap their work. I spent an enjoyable evening on Sunday planning the lesson. I was really excited about it, it felt like a while since I spent time preparing a lesson as much as this (LCD did send a lot of guidance if we wanted it from UNICEF to do with the rights respectings schools award). I had asked the HT who was interested in this and two classes wanted to do it. Once I started planning it I realised there was no way I could fit two lessons into the afternoon so I suggested that we put both classes together. Although technically this did work I am not sure that it was for the best. More of the pupils got to work on the lesson and learn about their (and all children’s) rights and responsibilities and then make some posters for their link school but I did not get to do all of the questioning and deeper discussion that I would have liked. Time was a bit pushed and as we were out in the open area, as were others, it was pretty noisy. There was lots of group work and we did get some good discussions, just not as much as if I had only taken the one class and/or over two sessions. I have just barely had time in my diary to get into the school to spend more time on our link projects. Set of cards and need to pick what the group think are the 6 most important. There were 20 cards, 10 of which were needs from the UN Convention of the Human Rights of the Child and 10 cards of wants like mobile phone, TV holiday trips, fast food. Explain the correct answers. Explain that these are some of the 42 articles within the Convention for the Rights of the Child. These are rights that were decided all children should have and have been signed by 191 out of 193 countries. So these countries have committed to fulfilling these for every child. Children’s needs should be met for them as they can mostly not provide them for themselves but rely on adults. There are things that every child can do though to make sure they are not denying other children their rights. if have right to freedom of thought and religion then have responsibility to respect others thoughts and religions. The pupils picked very similar cards for the 6 most important things with the two they most agreed on being decent shelter, clean water and clean air. They did not all pick education! I would have liked more time to discuss those but there just wasn’t! With needs and wants they mostly got it correct with some groups just not sure about which category a mobile phone was in and play so we got to have a good discussion about play and why that that was a need. I asked them what they thought their responsiblities were in relation to their rights above and with a little teasing it out of them in some cases they came up with the ideas themselves which I was very impressed with. They had just about enough time to do the task, could have done with a bit more but if they were focused it was enough time and sometimes with more time they don’t actually get it done any better. Part of the idea from LINK was for these posters etc to be sent to the school in Malawi. I will do this but I am not sure about it as these children are getting all of their needs met and I’m just not sure if it is the right thing to do. In saying that I could pinpoint pupils I was working with today who were not getting all of their needs met; clean air (pupils mentioned smoking), nutritious food and being free from neglect are a few that came to mind. If I had my own class I would have spent much longer on this over a number of days and it could be such deep learning. In fact looking forward to doing it (and going further, possibly with UNICEF’s Rights Respecting School Award) when I do have a class again. Post graduate certificate in Leaderhip and Management in Education. I have handed in a further two assignments and am just about to start the module which will start me on the diploma plus next term I will do my final 1/2 module of the certificate. Build up my use of this blog, Glow and twitter and attend the Perth teachmeet. I have blogged a little more now than I had done the first half of the session and see that improving more as I return to school in August. I do obviously use Glow all the time but had not built much from scratch in a while. This changed with the Fairtrade SLC glow group that I have set up with consulation of a Fairtade group within the council. I have really enjoyed this and have an International Education one to do now as well for the authority which I am want to do in a similar way having learnt a lot about what teachers want from the group from the input of the group. I read Twitter all of the time but am not so good at posting stuff up, still working on this one! I did attend the Perth Teachmeet and really enjoyed it. Extend my reading again. I am keeping a page on this blog with the non-fiction I am reading. It’s not exactly deep reading all of it but it’s good not be reading the chick lit trash that I tend to gravitate towards durng term time as I am generally too tired for anything else. Still not running and just saw a podiatrist today who says I have Plantar Fasciatis in both feet so I’m still not going to be running for a while. Was keeping my weight down, although not managing to lose any more, but went off the rails the last week or so as I have been really run down and leathargic after having my wisdom teeth out and the gums getting infected etc etc etc. As well as the Caley Challenge I now have a plan for the summer, although not booked it yet, which would give me something to look forward to. I would like to fly to Southern India and have a week or so travelling a bit down there, then fly to Kathmandu and do a group tour with Imaginative Traveller through Nepal and the northern/Golden Triangle area of India. The next day I would fly to Leh in the Indian Himlayas (highest airport in the world I think) and spend 10 days trekking/climbing Stock Rhangi, which at 6,153 metres and over 20,000 feet is the highest peak in India. It is also about 250 metres higher than Kiliminjaro, ideal as I was looking for a bigger challenge than last year! Although the bigger challenge would be that I would be going myself! Walking the Great Glen Way in 3 days in the Easter hols in prep for the Caley Challenge and the trek. Volunteering – I have got as far as looking up some info (in fact I was stunned there was so much) on the web about volunteering in my area but not done anything about it yet. Bit of a mammoth post this one but I was in a reflective mood! I spent Thursday afternoon in my own school in primary 4. I was doing some Glow with this class and it was great to see that they knew exactly what they were doing and were obviously using it. Their teacher is a friend of mine who works part time and so wasn’t in that day, missed a lot of Glow stuff initially due to being on maternity leave but has the IT skills to be able to pick it up quickly and use it for learning and teaching. The pupils were excited to be using it, knew their passwords, knew how to go to the LTS website to get the link if the portal on RM explorer wasn’t working and knew their way navigating about and how to use the learn news desk and discussions which was the parts I had used to set up a quick task for them. They told me how they use it at home sometimes as well. Nice to see that the kids had been using it and it didn’t have to be all singing and dancing for them to enjoy it and see the usefulness. It also let the DHT who was in with me see how it could be used. They were however all dancing for the next part of the afternoon. The class (and the other classes presumably) have been having their full allocation of PE a week which has included some fun fitness that the pupils take a bit more ownership of. I did a bit of a dancy/Body Attack type warm up with them and then some of the pupils had their own music in with them and did a bit of a routine for the rest of the class which they then taught to the class and did altogether. They all loved this and were very good at watching and following what their peers were doing. We then put on a piece of music and asked the pupils in their own space just to make up their own little routine and this next bit really surprised, and pleased,me. It was the boys, and this was all of them, who straightaway started dancing and making up hip hop/breakdancing routines and got really into it without any shyness. A lot of the girls on the other hand were not sure what to do and stood about and needed more direction from us before they got started. Programmes like Britain’s Got Talent, and the two dance shows on BBC 1 and SKY 1 are obviously having a big impact on boys and seeing groups like Diversity and George Sampson winning these is having a really positive influence. Being slightly obsessive about exercise myself and having danced for about 18 years (before switching to playing rubgy!) it was great to see the boys getting into this and discovering another form of exercise. On Friday I went to a meeting at one of my secondaries about using Glow for transition. I have already started this in more of a PSD format with another of the clusters but this secondaries English department was very keen to do a transition project and link it into Glow. They had two ideas to choose from and I think they will go for the one on advertising. They are going to look at advertising in general before asking pupils to make an advert for visiting Scotland, tie it in with their two day visit and then produce writing on it when they arrive in secondary in August. They are going to design a glow group to aid with this which I think will lend itself to this type of idea, with using a lot of media really well. They also had the idea of a separate glow group just for all of the P.7 teachers and secondary teachers involved to swap ideas, concerns etc. I am really interested in seeing how this develops as I think the teachers would like somewhere to do this but am not sure with time factors etc how much they will get into it, particularly in the first year, although I would like it to. I then visited the primary school where primary one have been doing the glow chat as well as using it for lots of other things. I happened to be in the ICT suite while they were doing this and it was great to see it in action. Last year the teacher had a P.1/2 and said that the P.2’s were good and went on with the P.1’s and they could manage themselves. This year it is a straight P.1 class and she said they are struggling more so P.7’s were working with them as buddies. Great for both sides! However I did get a shock when the P.1 pupil beside me started to tell his P.7 buddy about playing the latest Call of Duty game. I think I’m correct in saying it is at least a 16+ if not an 18 and I’ve played it – it’s so not appropriate for a 4/5 year old as far as I’m concerned! On Tuesday I am going to my sis-in-laws school to help her with her glow club as ever since her P.2’s have first been on they have been desperate to make a voki like hers! I said I would help her out with doing this as it could be rather chaotic and we are just going to use my log in to the site. We have put the xml web part onto a page of her group multiple times and put the kids names on each one so that they can all see each others! • P.4 teacher using the VLE with her primary 4 class for Vikings topic. They are doing their homework on it. Any kids who do not have access at home have a chance one lunchtime a week where she goes in the ICT suite with them so they can do it then. • P.7 teacher using the VLE with her primary 7 class for their Living in a Democracy topic. They are using it to do their topic tasks when they come to the ICT suite all together. • P.1 using Glow for lots of different things. Many pages in the group. Pupils using the discussion pages to write about what they learned/ liked about Chinese New Year. They have done Glow Chat within the group. Some pupils have parents helping them, some have done it themselves. • P.4-7 teacher using it for 2 main purposes with her class. She has a language page where there are tasks and discussion web parts for each reading group. They do weekly comprehension/discussion of their respective reading groups in these discussion boards instead of in their jotter. They also use the Learnewsdesk and another discussion board to do weekly news items. Either the pupils find a piece of news they are interested in and write about it in discussion board or teacher can pick the news piece and set reading for information questions on it. She also has a page for her tropical rainforest with all sorts of different information on it for pupils so they can complete research etc. This is a small school, no ICT suite and so three computers in the classroom so they can be scheduled on the computer for their language tasks during language time so each group at least gets once a week. • P.7 teacher has a good WW2 group with lots of discussion questions for pupils. Different discussion web parts for different elements ie rationing, evacuation etc and they have questions set in these which they have to find out the answers to and put in the discussion board. • In a different authority I am helping someone to run a pilot project within her school for 10 P.2 pupils in her class and their parents. She is running an after-school club for these 10 kids each week for 10 weeks. She then puts up a document for parents explaining what they have doing that week so that parents can help them follow it up at home. There are some lovely discussions on the literacy page about what their favourite book is and why. We have set up a multiple choice survey for this week using a news article from the Learnewsdesk on Haiti. I will be helping her to set up surveys as an evaluation at the end. I love the Learnewsdesk and always show that first along with the discussion boards as a way to use Glow for learning and teaching. It is something which practically guarantees enthusiasm from teachers and as described above with the P.4-7 teacher I am encouraging and helping lots of teachers to set this up as a starting point, particularly in small schools. That’s only a snapshot of a few that I have seen/helped with recently! Now that I have an iphone I am starting to see the benefits of Twitter much more. (Not to mention enjoying using many other apps!) I found it difficult to get into the idea of Twitter before having the iphone as only being able to use it at home was restricting. I now find I can follow conversations more easily and am picking up great links and hints. As other people have long been saying I now agree that it is turning into a great CPD tool for me. And it was great to get help from David Miller, initially through a comment on Twitter, when making up my first Prezi. I found out about Prezi through the Glow CPD Challenge group and did my first presentation with it at a CPD twilight session on CPD and study visits for Andrea Reid. I found it a bit tricky to navigate at first but much easier once I was doing it with a mouse instead of just the laptop touchpad. Really enjoyed meeting some people I follow on Twitter at that event and finding out about CPD Reflect which I plan to have a good play around on. I still don’t use Twitter very much for posting myself. This is from long standing fears/roots of not feeling that my points would be useful/worthwhile/correct/read. A good example of this was the Glow discussion that went on one Sunday a couple of weeks ago. I followed it with interest and had plenty of views myself but did not feel confident enough to air them. I am working on this! It’s the same way that I feel about meeting new people/going to meetings etc without knowing anyone; it fills me with dread and yet most people say I do not come across like this at all – I’m working hard on this one and I suppose if people don’t notice then that’s pretty good! This post was going to be more about Glow and how I have seen it being used lately but has turned into something rather more reflective, I’ll come back to Glow! I can’t believe it’s the end of the October holidays! Last term, as noted by my inability to get time to update this blog, just flew by and I was so, so busy. With the return of a few other development officers to school I was asked to take over the Clydesdale area for Glow. This area covers from Lesmahagow, down to Carluke, Abington, Leadhills, Biggar etc and considering I live past Glasgow airport means a fair amount of trekking about. I don’t mind it, it’s a chance to see and work with other schools and it is actually easier to find schools now than it was going round the roundabouts in East Kilbride! It does mean though that I get a lot less time in the office as it takes me so long to travel to and from schools and I am feeling a bit of pressure with all of the other things I have to do and all courses we are running at the Advisory. Still I love it and would not have it any other way really! Some schools have been doing some great things in Clydesdale and almost all have been enthusiastic about moving forward with me supporting them. With a lot of small schools in the area they are especially keen to do work across schools and we are going to get some topic work going and some transition to secondary groups within clusters. 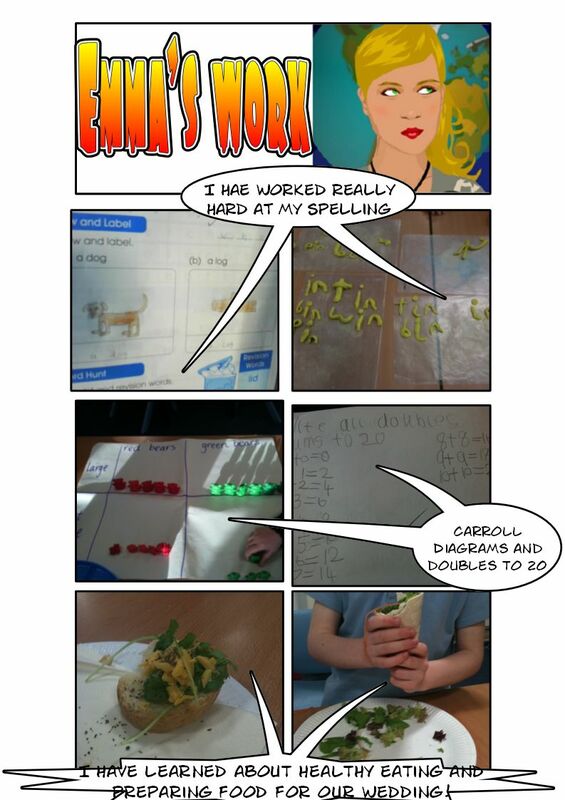 One school who have been using Glow a lot have really embraced it with p.1. Last year the p.1 teacher thought she would give it a go and if it didn’t work then fine! So after xmas she had the children logging in (and doing that themselves) and using their group to see photographs and use websites. They also used it for discussions and chat!!! I saw the discussions from last year and while a lot of it is unreadable, you can make out what it is they are trying to say. How good for their keyboard skills. She gave them laminated keyboards with the lower case letters on home to practice with and also had a parents page within her group with help and advice for parents and sometimes they went on with their pupils and helped them write what they wanted to say. I ran my first full day course by myself last term and it was great! I was slightly stressed, it being the day after my car died on the M74 on the way to do a school in-service session and I had to get public transport of 3-4 hrs a day but it didn’t matter! The course was on ‘Let’s Think through Literacy and with only 10 participants, who were all enthusiastic to get properly invovled it went really well and I got fab evaluations including two that commented that I had presented well so that was nice. It helps they got free books! http://www.st-louises-pri.s-lanark.sch.uk/ if you go to classwork and primary 6. Looking forward to this term although I am sure it will be just as crazy!